Ritchie's ownership of the two huge ranchos in South Lake County involved a few other men who played significant roles in our history. 24-year-old Robert Henry Sterling, along with an unknown Capt. R. Steele, is credited as builder of the Stone House, the oldest building in Lake County and State Historical Monument #450. He and his bride,Lydia Jane Wheaton, the first white woman to live in Coyote Valley, are thought to have moved into it following their wedding in May 1854. 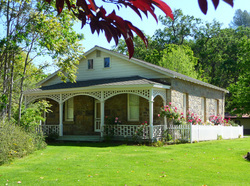 Stone House is now a museum, located in Hidden Valley Lake, open for viewing the second Saturday of each month or by appointment. Robert Henry Sterling was hired by Capt. A. A. Ritchie to manage to two huge ranchos in South Lake County. His assignment probably started early in mid-1852, and offered a welcome relief to a young man who already had been a seamen for over ten years. Sterling was born in New York City in 1829. His family soon moved to Bridgeport, Connecticut, where his father was a book publisher. As was common with young men at that time, he did not continue schooling past age 14, but went to sea, traveling twice to China on the Natchez and then twice again on the Sea Witch. His uncle, Capt. R. H. Waterman, had been master of both vessels. Sterling also worked as second mate of the Gipsy. By the time he arrived in San Francisco at the age of 20, the young man had circled the globe on a record-breaking trip that lasted nine months and twenty-six days, in addition to his trips to the Orient and two voyages to the West Indies. For a time, Sterling prospected and mined at Jamestown on the Tuolumne River. Back in San Francisco, he found the Tarolinta again at the wharf. Its captain was enlisting a crew for a trip to Honolulu and he joined as mate. After that trip and another to China, he worked briefly for the Pacific Mail Steamship Co. Returning to San Francisco in April of 1850, he spent a year in charge of various store ships on San Francisco Bay, then sailed back to Connecticut to spend a year. He returned to California in May of 1852 with his paternal aunt Cordelia, Waterman's wife. (Waterman shortly thereafter founded the towns of Cordelia, Ca, and Fairfield, Ca.). Young Sterling undoubtedly became acquainted with A. A. Ritchie through his uncle and was a ready choice to take charge of 30,000 acres of raw land and a large cattle operation in Lake County for Ritchie. Before Stone House was completed, he sent for his fiancée, Lydia Jane Wheaton of Guilford, Connecticut. They were married in Benicia in May 1854 and took residence in Stone House. Lydia is reported to be the first white woman to live in the Coyote Valley area. Reports show earlier settlers in Lake County: John Cobb's wife Esther and four children living at Cobb in late 1853 and the Walter Anderson family living in the Lower Lake area as early as 1848 before moving on to Anderson Valley in Mendocino County. The Sterlings apparently left Lake County for Napa shortly after Ritchie's death in July 1856 forced sale of the Guenoc property. The Sterlings’ one child, Julia, is shown on the Census of 1860 as one year old. The Sterlings were prominent in Napa society. 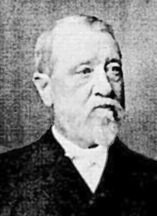 Robert Sterling engaged in the lumber business, insurance and real estate. He was deputy clerk and assistant assessor of internal revenue in Napa. In 1873 he was on the founding board of directors of the Napa state , and from 1890-94 was Napa postmaster. 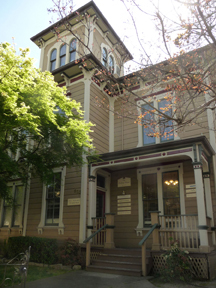 The house Sterling built at 833 Franklin Street in old town Napa has been converted to offices and is now owned by a Marin County couple. It is listed with the Napa Historical Society as the last remaining example of the popular 1870s Italian Villa style with tower. The carriage house, on the same property, now houses a community home for teens. Lydia died in 1907, Robert in 1916 after years of failing health. Both are buried under a horizontal plinth in Tulocay Cemetery in Napa. The inspiration for the Stone House? Sterling's fiancée came from a town in Connec-ticut where the town fathers had built stone "safe houses" rather than a fort to protect their villagers. 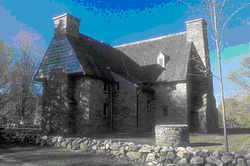 Guilford’s Old Stone House is the oldest stone house in New England, and now a state museum and National Historic Landmark. The first stones were laid in 1639, 135 years before the American Revolution. Masonry was unusual in New England because of the lack of lime to make mortar. Henry Whitfield, the town’s first minister, had this house constructed using mortar of yellow clay and crushed oyster shells. Would Robert Henry Sterling found one of the few deposits of lime in Lake County? Or been inspired to follow the example of Guilford’s minister?